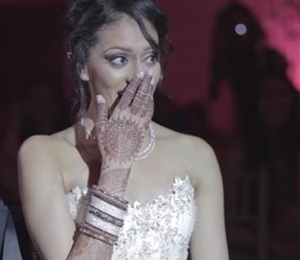 Canadian groom Frank Gregoire set a perfect example of how love transcends all barriers when he sang a rendition of Tum Hi Ho for his Indian wife, Simran Malhotra, at their wedding reception. Frank had initially decided to recite a poem or write a song for his bride but after speaking to his mother-in-law, he decided to sing Tum Hi Ho for Simran. It took Frank six weeks to learn the lyrics and piano chords to popular Bollywood love song. “At the time I approached Simran’s mom and she recommended a few options, one of which was Tum Hi Ho. Once I read the translation, I realised I couldn’t have found anything more perfect to express my feelings to her,” he says. The song is about appreciating your true love and not wanting to live without them. It is evident that he practiced hard for he pulled it off with proper Hindi diction, maintaining the essence of the original song that left his bride in tears of joy. The couple got married on June 27 in Baltimore, Maryland and Frank performed the song during the reception after the couple’s Sikh and Christian wedding ceremonies. On their wedding day, the couple invited 130 of their closest family and friends, who were all in tears when they heard the groom sing for the first time. “All our family and friends are on cloud nine still. That moment is one I will never forget for the rest of my life,” said Simran. Frank, who has been called a “closet singer/piano player,” comes from a musically talented family and plays for fun on weekends. Following Franks performance for his bride, the groom’s uncle Marc joins his nephew to recite WaWaWaWa — a goofy line his family came up with during one Christmas in Montreal. This article was found HERE.